This offer is only available for first time depositors. Min deposit is £10. For every £1 you deposit, 1 Free Spin will be credited. Up to 50 Free Spins on Book of Dead. Spin Value: £0.10. After your first deposit you may claim your 20 Extra Free Spins and the OJO Wheel by visiting the Kicker Section. OJO’s Rewards and Game Play policy applies. Read more. All winnings are paid in cash and there are no wagering requirements. PlayOJO Casino launched in Februry 2017 and it is operated by SkillOnNet Ltd. Already in the first year of operation, PlayOJO Casino has gained over 100,000 player and has picked up a number of awards, one of the awards is prestigious EGR Rising Star award. The cause which has led to their unprecedented success, is obvious. It is, that they are the first online casino ever to completely call off the wagering requirements. In addition, they have bought to the industry the exclusive OJOplus feature that gives money back on every bet the players make. And that is not all – OJO is running the biggest ever promotion – OJO´s Fantasy Fortnight and the prizes includes high-tech items like laptops etc but also getaway to anywhere in the world – you can head to Maldives, Jamaica, Cuba and many other marvellous destinations. PlayOJO Casino offers the biggest and best games from the top providers. Supported languages are English, German, Finnish, Danish, Swedish and Norwegia. OJO calls the OJOers – the high rollers and just-for-fun-guys – anyone who would like to have a great time and who knows the feeling of pure game. The design of the site is playful and they have a funny logo. The developers have used O, J and O letters for their logo. It is possible to say that they have turn their logo into Casino´s mascot – making a happy face of it. The menu on the left contains links to the most important directories and guides you through the whole casino. There is also a demo video available with a short introduction about the features available to the customers. Also you´ll find a video clip with the opinions of the OJOers. OJO gives you control and the more you play, the more you should get. You are welcome to be one of the OJOers! 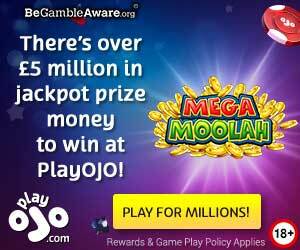 Playing at PlayOJO Casino does not require a software download – all the PlayOJO Casino’s games are designed on flash. PlayOJO Casino uses for software SkillOnNet, Net Entertainment (NetEnt), Microgaming, Amaya, Merkur, Barcrest, WMS, GVG, NextGen Gaming and Blueprint. There is a special mobile version of the interface available and it is supported by the most popular operating systems. The features of the games you can find on the manuals added and the visitors can test online games free. New games. The section includes the titles that deserve the player´s attention for one special reason – the latest additions. Right now in this section you can find a list of following games: Fortune Favors, Easter Island, House of Doom, Gem Rocks. Popular games. PlayOJO Casino has some of the most popular games on the web and today´s hottest games are Vikings Berzerk, Book of Dead, Jackpot Jester 50 000, Viking Runecraft, Immortal Romance, Gold King and Rainbow Riches. Roulette play. In this section you find a great variety of French, American and European Roulette. In addition you find there Classic Roulette, Italian Roulette, Sizzling Hot Roulette, Club Roulette and Reel King Roulette. Blackjack games section. There is a pretty thorough collection of Blackjack games like Blackjack Turbo, Blackjack Italian and many more. Live casino. In their live dealer portfolio there are in different variants Live Roulette, Blackjack Live, Blackjack Pro Live, VIP Blackjack Live, Immersive Roulette – here you can chat with the dealer and other players at your table. PlayOJO Casino offers the most widespread selection of banking options. The players can use the popular credit and debit cards such as Visa, MasterCard, Maestro; also Online-Wallets including Neteller, Skrill, EcoPayz, PayPal and PaySafe Card. Accepted currencies: AUD, CHF, CAD, EUR, DKK, NOK, GBP, RUB, SEK, USD, ZAR. The main currency is euro, but deposits accepted in other money units as well. Minimum deposit €10 and minimum withdrawal €20 or the equivalent value in any other currency. Some payment methods take additional commissions, so it is important to read terms and conditions before picking the deposit method. The deposits are usually carried out instantly except for deposits via bank transfers where you have to wait 2-5 days. Via online wallets PlayOJO Casino promises to process withdrawal requests within same day. Withdrawals via wire transfers and debit/credit cards take between 2 and 7 business days. *Minimum Wire Transfer transaction is €50 except if the deposit is made via an e-banking service, in which case the minimum withdrawal is €30. OJO´s Welcome Play Package – 1 free spin for every €1 you deposit up to 50 Free Spins. All winnings are paid in cash and there are no wagering requirements. Kickers. By logging in and heading to the Kickers section you can claim your Kickers. And every day there is a new Kickers – special promos, daily offers – for the players to find. You have to visit the site every day because the Kicker lasts only 24-hours. OJO´s Reel Spinoffs. You are very welcome to enter OJO´s Fantasy Fortnight competition by going to Reel Spinoffs. By playing live tournaments it is possible to win 1000s of Free Spins. There are tournaments every day and the more you win on the spins the more points you collect and if you finish on the leaderboard in the top 3 – then you are a winner! OJO A-lister – Get the VIP treatment. A-list Manager checks play activity and invites the most active OJOers to become A-listers. 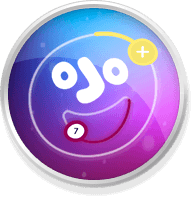 If the player becomes one of the A-lister then OJO promises to take an amazing care of the player. Club OJO is all about rewarding loyalty and it is based on invite only. It is not related to the level of the player and the A-list status is evaluated on a monthly basis. A-lister can look forward to higher withdrawal limits, increased betting limits, exclusive kickers and competitions, also birthday gifts and luxury gifts. The reel roulette race tournaments have sent the lucky winners to a luxury trip to Paris, Dubai etc. The exclusive OJOplus gives money back on every bet, on all games – OJO Casino gives you free money every time you play. They use the latest Secure Socket Layer (SSL) encryption technology which guarantees that none of the financial or personal information provided to the casino by players may be decoded, intercepted or used malevolently. Help section with video tour, manuals and answers to frequent questions.